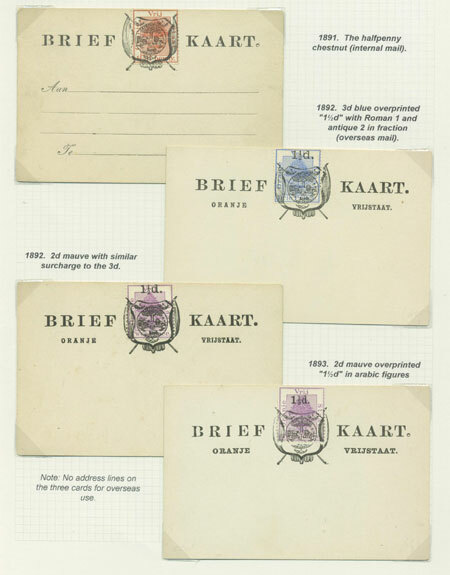 The first stamped postcard was issued in February 1884, when the internal postcard rate was 1d. Shades of colour range from orange-yellow to brownish orange. Although the internal rate fell to a halfpenny in 1891, provisional cards were made locally until 1898 when a definitive card was issued. 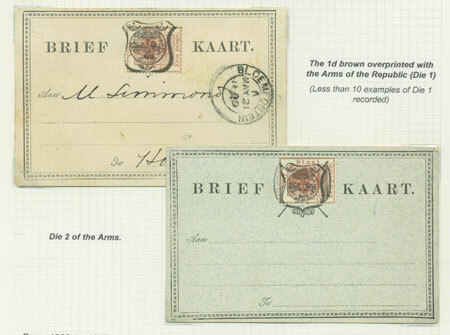 Both halfpenny and penny reply paid cards were issued in January 1898. 1889. 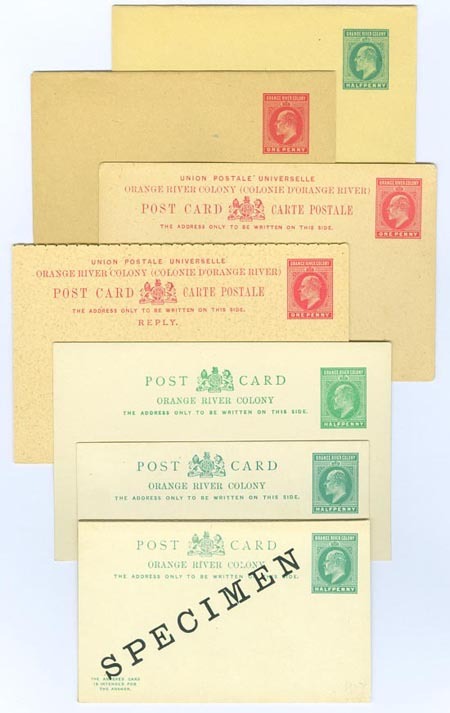 A temporary shortage of the one penny postcards resulted in the first provisional postcards being introduced. 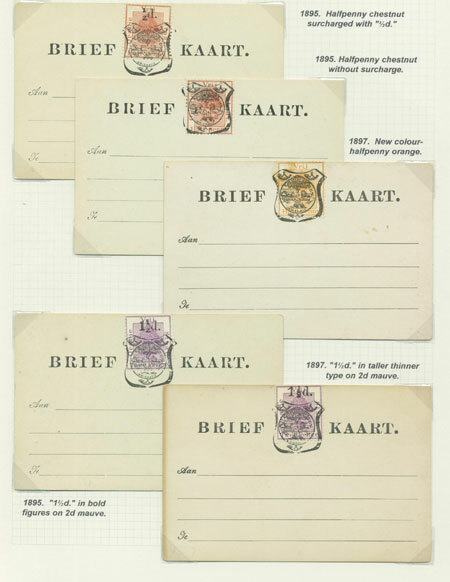 From 1889 to 1897, occasioned by frequent temporary shortages, provisional postcards were produced. The card was cut to shape and size, stamps for the appropriate values affixed and the whole overprinted. 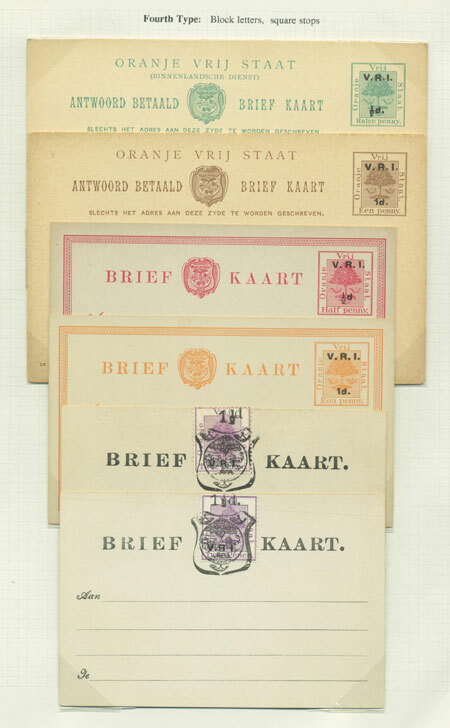 The overprint included the Arms of the Republic which obliterated the stamp, "BRIEF KAART." and dotted lines for the address, and the whole was impressed all in one operation. 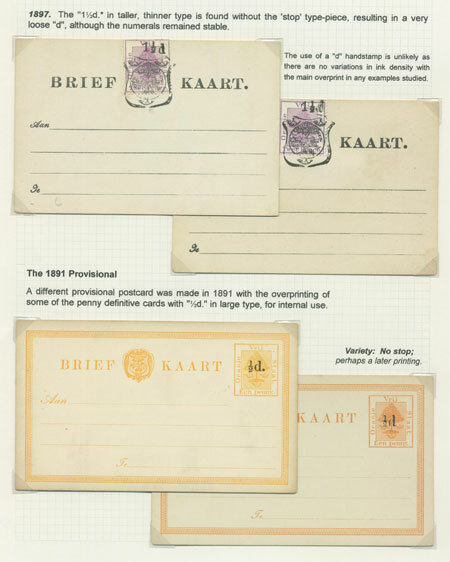 This method of postcard production is unique to the Orange Free State. Five different Dies of the Arms are identified. 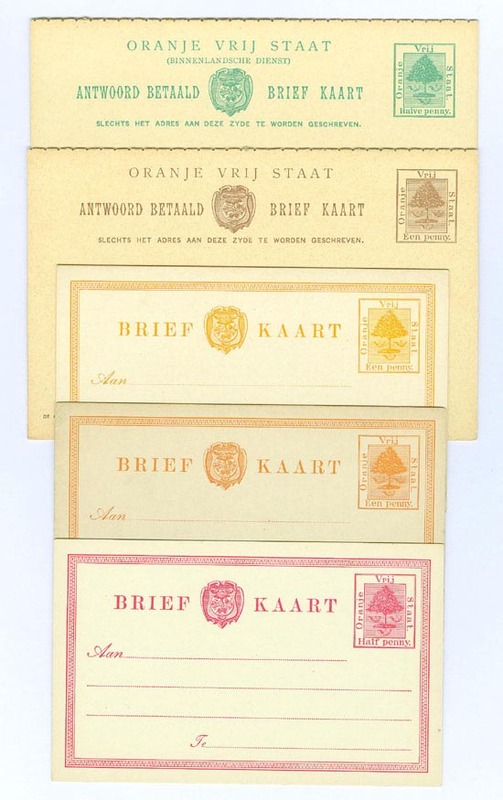 Five basic stamps, some with additional surcharges, were utilised and altogether 15 different combinations of Die and stamp are known. 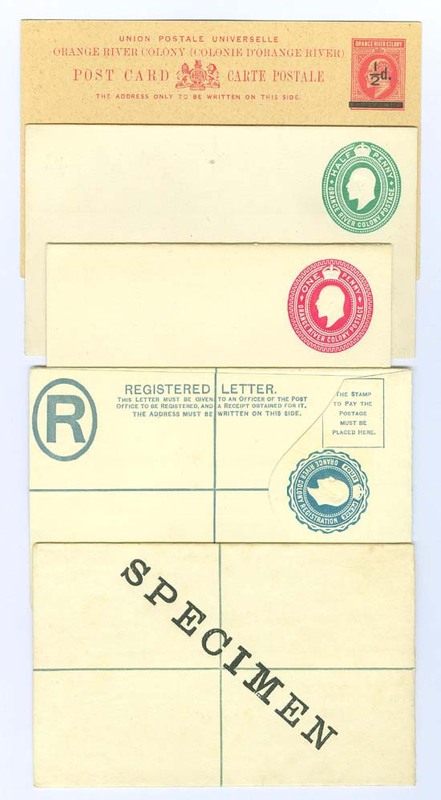 All stocks of stationery found in the Post Office by the British were given the V.R.I. overprint. 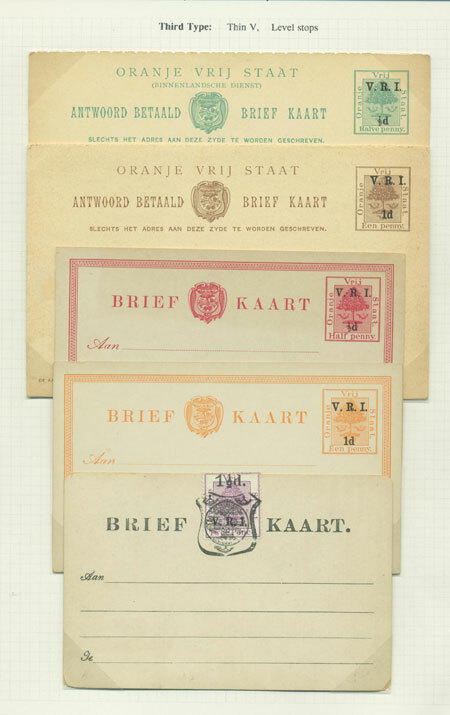 As with the stamps, when the stocks of VRI printed postcards ran out the situation was such that resource had to be made to use Cape cards with an Orange River Colony overprint. The Cape ONE PENNY on three halfpence provisional card was further overprinted. The card is found with a stop after PENNY and also without a stop. It is also found with UNION POSTALE UNIVERSELLE either printed on the card or handstamped, to give a combination of four versions. 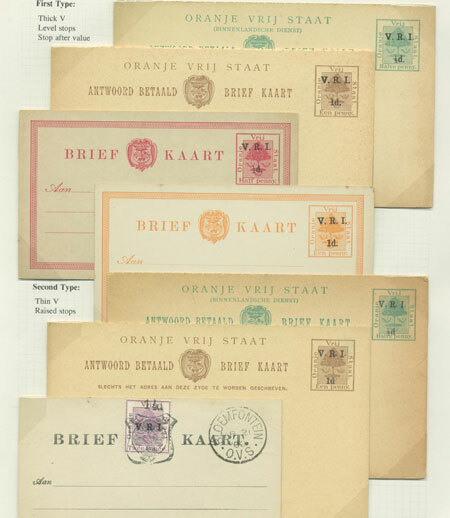 Additionally the ORANGE RIVER COLONY overprint is found in five different type settings giving a potential 20 different cards for the collector. 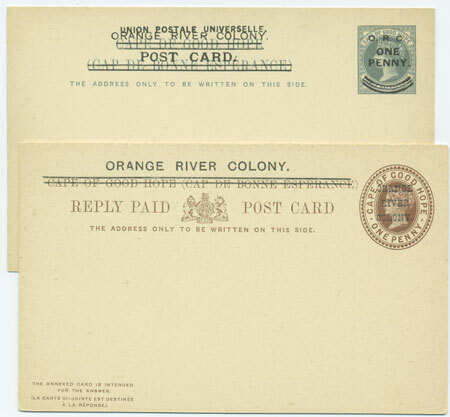 The Cape Reply Paid Post Card was also overprinted. 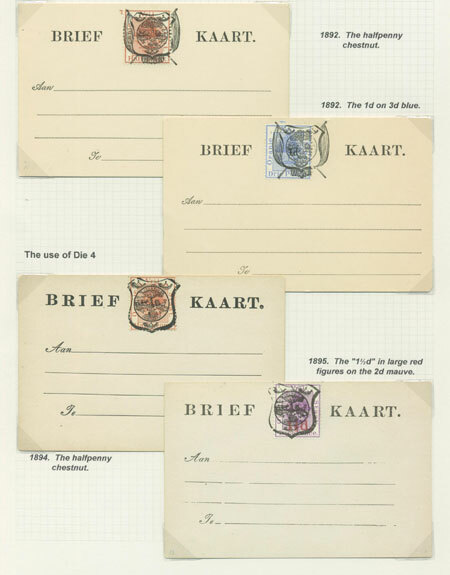 A selection of the stationery printed with the head of King Edward VII. A halfpenny provisional postcard was produced in 1909 by overprinting the current one penny card with the fraction and a heavy bar.